Delray Beach, Florida - December 8, 2015 - Best Security Industries (BSI), a premiere provider of certified, pre-owned and private label electronic article surveillance (EAS) systems and custom video solutions, today announced that it has been named 2015 Retail Partner of the Year award by Axis Communications at its 10th annual Axis Connect & Converge Conference (ACCC) held in San Antonio, Texas. Axis, the global leader in network video, presented these annual awards to top channel, software and technology partners. "We are both proud and honored to be recognized by Axis Communications as its Retail Partner of the Year," said Matthew Sack, CEO of BSI. "Through our partnership with Axis over the past four years, we have realized significant growth in our IP-Video sales not only with new retail customers but through expanded opportunities within our existing base." The event hosted nearly 400 attendees from various VMS companies, technology partners and integrators serving a variety of vertical industries including retail, government, transportation and education. The meeting was designed to inform its various partners on new products and solutions, provide feedback for future and existing products and offered in-depth training as well as hands-on experience with Axis products. An important part of the program was also to pay tribute to and recognize those companies who have shown a proven track record of success in design, selling and implementing new solutions based on Axis products. "Axis partners are not only part of the industry's largest professional network, but are also an extension of our team," said Larry Newman, senior director of sales, Axis Communications, Inc. "It is an honor to bring together the top companies in our industry at ACCC and recognize those strong relationships and shared sense of leadership in providing innovative security and business solutions. These companies are leading the way to a smarter and safer world for all." BSI specializes in analog-to-IP phased migrations as well as design and installation of new, high definition IP solutions, advanced analytics, cloud-based services and open architecture platforms. The company works with its customers to get a clear understanding of their unique challenges in order to design a cost effective video solution that provides real value. 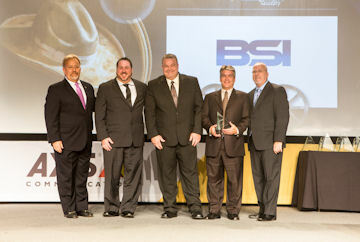 BSI has built a strong reputation by engineering highly effective video solutions for many of North Americas leading retailers as evidenced by this latest award. "Over the years, we have built our partnership with Axis to include joint sales calls, hosting various events together and actively participating in future product and solutions development to meet our retail customer needs," concluded Sack. Axis works with 75,000 partners across 179 countries at every stage, from distribution to installation, to offer end customers the best solutions for their specific needs. Axis' partner network includes the Channel Partner Program, the Application Development Partner (ADP) Program, the Architecture and Engineering (A&E) Program and the Technology Partner Program. For more information about Axis partners, visit http://www.axis.com/us/en/partners.